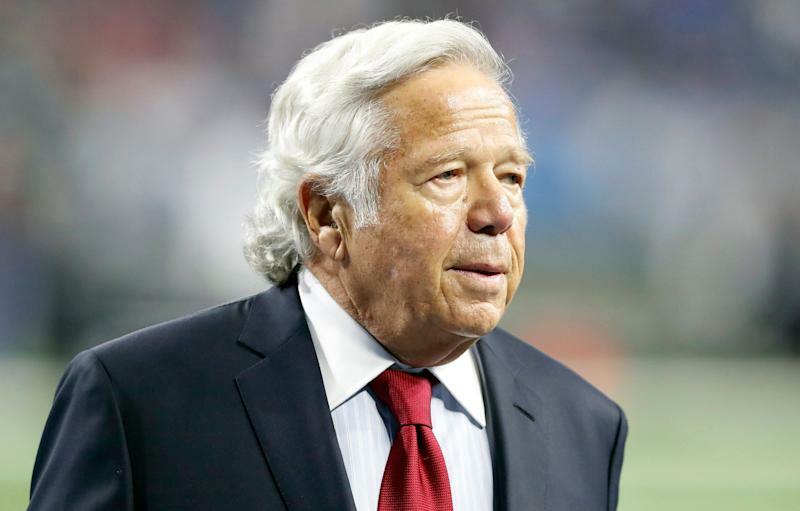 A man who says he was just getting a massage at the spa at the center of the Robert Kraft prostitution scandal is suing, claiming his civil rights were violated. The man who goes by “John Doe” filed a federal lawsuit Monday, believing that he’s caught on video visiting the Orchids of Asia Day Spa in Jupiter, Florida on Jan. 19, the same day that the New England Patriots owner is alleged to have been recorded receiving sexual favors at the spa, according to documents obtained by USA Today. While Kraft and 24 other men are charged with soliciting prostitution as part of a sting conducted by local law enforcement, Doe is not charged with any crimes. "Mr. Doe had a reasonable expectation of privacy when he entered that private room, on private property, to receive treatment from a licensed healthcare practitioner — namely, a massage therapist," Doe’s attorney wrote in the lawsuit. Joseph Tacopina, one of Doe’s attorneys, told USA Today that the lawsuit could evolve into class-action litigation from other potential plaintiffs who visited the spa. Doe’s attorneys wrote that he undressed and received a massage in a private room and “did not engage in any sexual or illegal activity at any time while receiving his massage." The Jupiter Police Department, detective Andrew Sharp and the Palm Beach County State Attorney are listed as defendants in the suit seeking unspecified monetary damages, according to USA Today. Sharp applied for the warrant to install hidden cameras at the spa, arguing that he and health specialist Karen Herzog believed human trafficking was taking place, citing beds and a refrigerator containing food on the premises. “Herzog advised it appeared as though the female employees were living there as there were two rooms with beds, including sheets and pillows,” the warrant reads. Monday’s is the latest legal attack on the use of hidden cameras to collect footage as part of the sting. Kraft’s attorneys have argued on multiple occasions to suppress the video and claimed on April 3 that police called in a fake bomb threat to install the cameras, a tactic they argue was justified by police claims of human trafficking. Kraft’s attorneys argued that the tactic is “constitutionally problematic” and reserved for “extraordinary circumstances” in cases that involve terrorism, bomb making, racketeering and other felonies. “The underlying criminal activity that was surveilled involved felonies that were far more serious than the misdemeanor prostitution alleged to have taken place here, and the justification for the invasion was far stronger,” the April 3 memo reads in discussing cases where similar tactics were used. Prosecutors have since admitted that there is no justification for human trafficking charges. "We have no evidence that there's human trafficking involved," a prosecutor said last week.